If you are looking for a villa with a private pool, which is also a part of a complex, look no further! Villa Ifara is a bright and spacious 3 bedroom property located in the Panoramica Heights Complex. It has access to many facilities including a restaurant, mini market and large communal swimming pool. The beach, shopping centre and the centre of Las Americas are just a short drive away. What's not to love? Air conditioning/heating in the bedrooms and lounge, pool heating and WiFi are included . Spacious inside and out with all the Panoramica Heights Complex facilities on your doorstep - perfect! Outside, Villa Ifara has a private pool, which is all one depth at 5 feet and is surrounded with sun loungers, the 2 games tables and a BBQ. There is a covered area for dining alfresco- a great place to escape the hot Canarian sun with a book or refreshing drink . There is also a covered seating area for relaxation. The villa has space for a hire car within the villa grounds. The entrance to the villa is through the private gates. The open plan lounge and dining area is bright and has a comfortable sofa, a few tub chairs, a coffee table, a flat screen TV, and a table with chairs . The fully fitted kitchen is adjacent. There is a back door next to the dining area leading to the rear terrace and pool area. A central staircase leads up to the first floor where all 3 bedrooms are located. The double bedroom has an en suite bathroom and patio doors leading to a small balcony where you can enjoy the views over the resort and out to the Atlantic Ocean. The 2 twin bedrooms are separated by a shared shower room. There is a WC on the ground floor. -	The hire of towels for a small daily charge. Villa Ifara is a semi-detached villa and on the Panoramica Heights Complex. It sits in an elevated position with the splendid cinematic views over the resorts of Costa Adeje and across the ocean to the neighbouring island of La Gomera. The resort centre of Costa Adeje is a short distance away by car and has great beaches, a marina and a waterpark. Our Villa Masca is just behind Villa Ifara. There are 4 other villas we feature on this complex, Villas Borondon, Teno, Tamaimo and Taganana. There is a small mini market located in the reception for emergency supplies. The local commercial centre and the resort of Las Americas where you can find a huge array of shops - from trinkets selling kiosks to designer boutique shops-are short drive away. There is a busy local market on Thursday and Saturday in nearby Fanabe. There is on site restaurant offering breakfast, lunch and dinner. In Costa Adeje centre there's a range of local and international eateries, as well as a variety of places to enjoy a drink. Options range from contemporary chill out bars to family friendly pubs with live entertainment . It takes 5-10 minute in a car to get to the centre. The closest beaches to the villa are Costa Adeje and Callao Salvaje, which can be reached within a 5 minute drive. There are a number of beaches located in the South of Tenerife, from expansive sandy stretches, to smaller black sands. Long promenades run the full length from Los Cristianos to La Caleta, with plenty of water sports available, and almost all beaches offering services along with beach huts, ice cream stands and showers. There are also Playa La Pinta, Playa De Bobo, Playa De Troya beaches - all within a 5 minute drive away. The famous Siam Park is so much more than a water park! You can try water slides, stroll around the winding pathways, visit the authentic Thai themed floating market or enjoy your favourite drinks with a snack or a meal. Aqua Land is more suitable for younger children as it offers a greater choice of rides. Towards Fanabe there is Mikki Play Park opposite the market, offering a ball park, a small mini golf course and a selection of games. A great selection of golf courses in the south of Tenerife. Las Americas Golf Course and Club is closest to Villa Ifara. Villa Ifara is not available to book for season as it is sold out. Take a look here at the Tenerife villas that are currently on sale. One of the main resorts in the south of Tenerife, and one of the most popular, only 15 minutes drive from the South Airport. Los Cristianos, originally a quiet fishing village is centred around the original harbour area. The harbour is still home to a number of small fishing boats, which sell their daily catch amongst a few small stalls. Popular daily excursions to go Whale &, Dolphin watching also leave from here, and it is the main port for the ferry to the neighbouring island of La Gomera. Los Cristianos boasts 2 of the best long golden sandy beaches in the south, with a pretty coastal promenade that stretches around to Playa de las Americas, with a view to La Gomera. 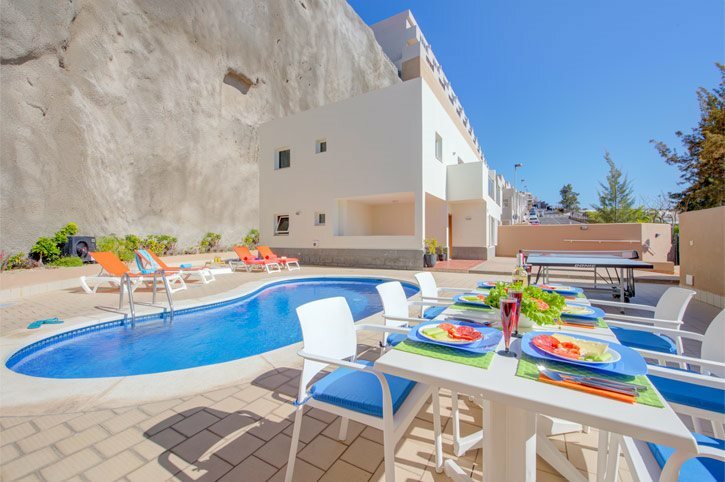 Los Cristianos has always been well known to families, with children welcome everywhere. A wealth of Spanish and international bars, restaurants and cafes line the streets, and you can head to the main square for the local fiestas and traditional entertainment. Los Cristianos is also a popular place on a Sunday due to the very large market held here, or you can head into the cobbled back streets where you can find many small shops selling everything from handmade jewellery, local crafts, clothes, household items and perfumeries as well as liquor stores to make the most of the duty free shopping.